Signage on the Newcastle Forshore Shared Path. One giving a speed limit and prioritising pedestrians the other leaving to rider's judgement. Tram The Newcastle Tram is now in operation. It is a wireless implementation relying on pantographs to recharge batteries at the stations. The Heavy rail line has been cut at the western end of the CBD. Wickham is the new interchange from heavy rail to light rail. Docked E-Bikes The new tram runs partly in the rail corridor and partly on the road. The light rail extends about 500 meters beyond the Newcastle Railway Station. It was good to meet Naomi, one of the co-founders of Johnston Street Jazz. at 81 Johnston St Annandale. Tix: $20/$10 for an evening of improvised jazz. The format of the evening is generally one set of great music (mostly instrumental, mostly local, mostly unamplified). Followed by Free For All, an open improv concept where the audience becomes the band. Last night was a packed house for a two set performance by Leonie Cohen and her crew. Cohen's launched her new album “Pages Suite”. The performances at Johnston Street jazz are being captured in paint by an artist. '60s Annandale will be a short walk around the block, with a few stops and lots of history, with a focus on Annandale of the 1860s and 1960s. This morning, I took a perambulation to the opening of the NSW Federation of Community Language Schools conference at the Seymour Centre. 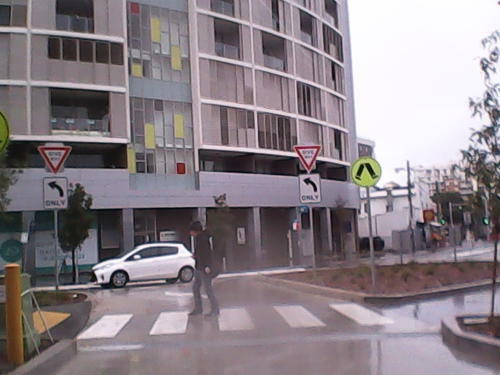 Last night, it was pointed out that I had raised the issue of giving pedestrians priority at the traffic lights directly outside the Ashfield Railway Station at a Traffic Committee meeting, which I chaired. A little while back a Notice of Motion was put up to thank the state government for building a commuter car park at Ashfield Station in Brown Street. In voting against the motion, I expressed my view that commuter car parks in the inner west are such a bad idea as they bring additional vehicles into the station precinct, endangering and inconveniencing those who walk and cycle to trains. THAT Council call upon the State Labor members for Summer Hill and Strathfield to deliver a similar carpark and facilities at an appropriate location if Labor is successful at the March 19 State Election. THAT a review of the opening times of swimming pools and other facilities at the AquaticCentres including extending (or shortening) the season and hours be undertaken and areport be brought back to Council.